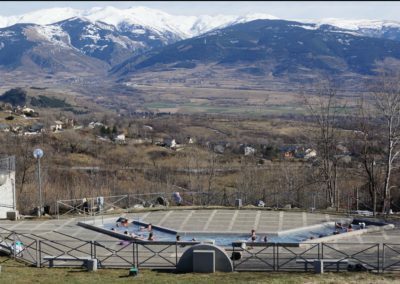 In this village of La Cerdanya, hot water springs are linked to the ancestral art of working granite, the perfect combination to immerse yourself in healthy baths in comfortable tubs sculpted since prehistory. The crossing of Carlit 50 Lakes is normally done in four stages, plus a fifth to climb to the top of the Carlit. 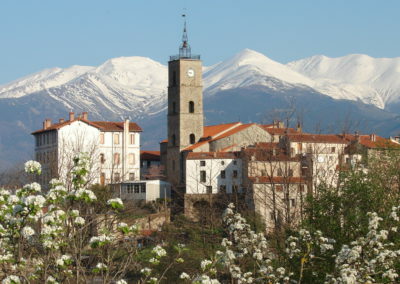 If you want to walk more, however, you can link a two-stage itinerary that allows you to visit charming villages such as Dorres and Porté – Puymorens, and see great views over the Cerdanya and the north face of the Catalan Pyrenees. And when passing through Dorres (end of stage), we have the great gift of being able to bathe in its thermal baths. Built outdoors, in the middle of the trees and with an impressive visit of the summits of the Puigmal, the Dorres Baths offer lovers of nature and water moments of peace, calm and tranquility. If we look back, man has used these natural waters since prehistory (1500 BC) and already in a more usual and organized form from the seventeenth century. 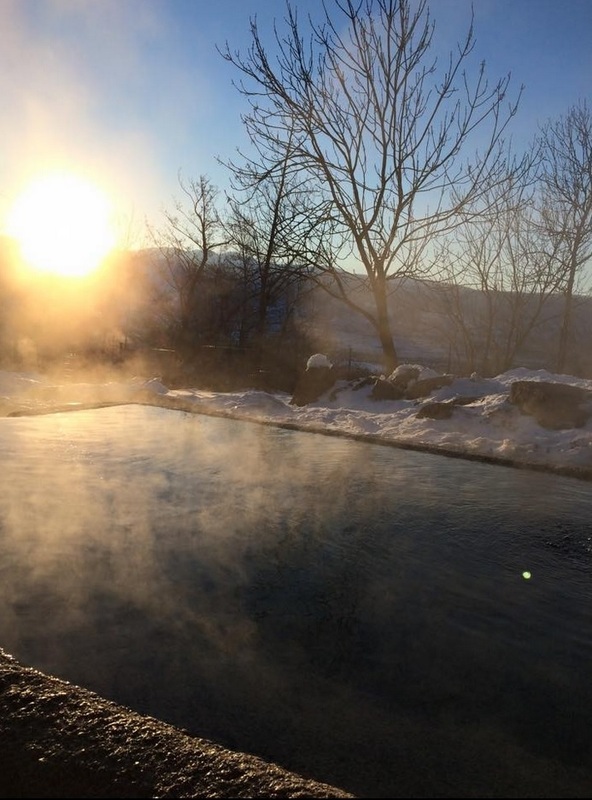 Widely used since the 19th century, the qualities of these hot and sulphurous waters are already cited in 1926 in the Guia de la Cerdanya by Emmanuel Brousse. The temperature of the water when leaving, the highest in the country, reaches up to 41ºC. The water springs at a temperature of about 41 ° C, and the flow and temperature remain regular throughout the year. The baths relieve osteoarthritis, sulfur is beneficial for the respiratory tract, and many of the irritations of the skin are lightened or cured by sulphurous water. After a good walk, the recovery inside the water is frankly pleasant, with the addition of the spectacular views of the whole Eastern Pyrenees. For a long time, the baths were kept in free access and without supervision. In 1961 the city council met in the place and the project was concreeted. In 1991, two old bathtubs carved in granite blocks and the washing place were completed with a new granite basin that could accommodate more bathers. The prehistoric men who live in the shelters of the mountain of Dorres already appreciated the pleasure of a hot bath. They left traces of their presence in the village: polished stone axes, top stones, and you can see a beautiful dolmen in Brangoli, a nearby neighbourhood. 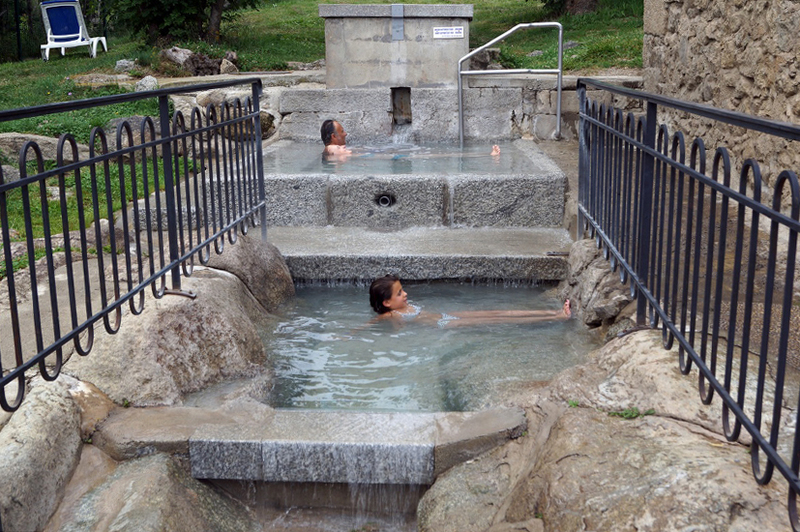 500 meters further down, in Escaldes, the existence of baths has been proven since Roman times. Near the source of Dorres, the ruins attest to the ancient use of hot water in spring. The old laundry, which is now a pleasure for bathers, was cut in granite in 1841 (the date is carved in the rock below). The hot, sulphurous water was certainly effective in washing the raw wool of the sheep in this basin far from the village. The water of the town’s laundry in front of the town hall has the same characteristics as the baths, and is still appreciated today for its softening qualities and the washing of wool clothes. 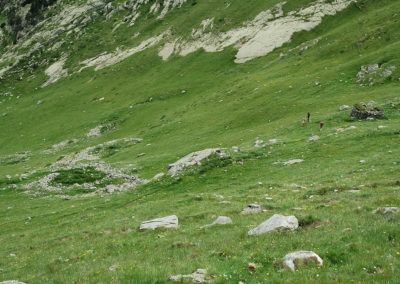 We recommend going after the 5 days walk of the Carlit 50 Estanys, or even on foot if you want to lengthen the crossing with the two stages that link Vésines and La Bullosa on the Cerdán side, passing through Porté – Puymorens and Dorres. Getting into the water after the walk will be truly rewarding!